Technology has changed the way we think about, view, and interact with the world around us, including how we make purchases. Online shopping isn’t limited just to deliverable food and office supplies – a huge portion of consumers find their next home online, too. In fact, according to JD Power & Associates, 88 percent of buyers looked for properties before researching an agent, and a growing body of evidence shows that almost all of those searches begin online. In the age of internet searches, sellers must rethink their efforts by employing a thoughtful and comprehensive marketing and selling strategy aimed at bringing online buyers through the front door. In an increasingly digital landscape, the sale of your home now must happen twice – first online, then second upon showing. We work to ensure that your listing succeeds at both. Here are the top five things we recommend to all our clients to sell their homes as quickly and profitably as possible in the digital age. While more use of video is advocated (see #2) video footage of your listing should be a supplement to – not a replacement of – photographs. Professional photography can make or break a home sale before the buyer even leaves their couch. This simply cannot be stressed enough: photos and videos sell homes. As our local real estate market moves towards the direction of a buyer’s market, your competition as a seller will become more prominent. This means that there are fewer buyers looking at a larger number of homes for sale. As those buyers scroll through the listing options on sites like Zillow® and Realtor.com®, they will make decisions about what properties to stop and click on based almost exclusively on the initial photo of your listing. Once they access your listing, your photos need to continue to wow them. One great photo just isn’t enough to get a showing appointment. We work with professional photographers to ensure that our listings are well represented from the inside, outside, and the surrounding areas. How your home presents online is easily the number one deciding factor in how quickly showings will be scheduled. The more showings, the more interest. The more interest, the more potential buyers. The more buyers, the faster we can sell your home and the more likely we are to get the best possible price. Video is the new standard online. It is easy for casual browsers to consume, especially given that most social media sites will autoplay videos, meaning zero active effort is required on the part of the consumer. But beyond that, video is a powerfully persuasive tool and a gift that keeps on giving. Everyone who has ever looked at something online only to be disappointed in person knows that photographs can be deceiving. Whether it is a house, a car, or a bedroom set on CraigsList, what you see online and what you see in person can be radically different, for better or for worse. With video, buyers who are browsing online have a much more realistic understanding of what your house is like. They can see the layout, the flow of the rooms, and get a realistic understanding of size and perspective. We use high quality video from a professional videographer that also showcases the surrounding areas. Schools, shopping, local hotspots, healthcare, commuting, and other essential services are a huge deciding factor in almost any home purchase, so why would you skip the opportunity to sell prospective buyers on both your home and your neighborhood? This becomes even more important when dealing with out-of-town buyers or families with multiple “decision makers,” who might not all be able to visit the home together. Videos can be shared and rewatched, allowing the buyer to relive their walkthrough experience and share their excitement and enthusiasm with friends and family. Video not only helps highlight your home’s unique beauty and the character of your neighborhood, it also helps reduce the number of people who leave showings of your home with unmet expectations – wasting time and effort for everyone involved. Social media is unrivaled player in the digital age home sale. While listing sites like Zillow® are extremely popular, social media can play a unique role in increasing the exposure of your home. The very “social” nature of social media means that even non-buyers can actively engage in discovering, sharing, and promoting your listing. We leverage our strong social media following to share active listings and promote the surrounding neighborhoods, local hotspots, school districts and more. Your professional photos and video will be shared within our extensive online network, meaning that your listing will get exposure to a wide variety of people. It’s not uncommon to see showings result from a non-buyer sharing a post or tagging a friend who they know would be interested in one of our listings online. The effectiveness of these digital campaigns is based on a well-rounded approach to promoting the listing. It isn’t enough to push a Facebook post with a “just listed” sign and a link to the MLS. If you want to be competitive against the other homes for sale in your area and get the most money for your home, work with a real estate team who understands the importance of a comprehensive digital strategy for your listing. Staging a home is so important. The best photographer or videographer in the world can’t make a cluttered kitchen or outdated decor show well online – staging is a critical step in the process of getting great photos and videos. A holistic approach to staging involves more than just painting the walls and taking out a few pieces of furniture, which is why we schedule a consultation appointment with a professional stager when preparing a new home to list. Don’t worry – a professional staging job shouldn’t be expensive or overwhelming. It’s also not about judging or critiquing your style or decor – it’s about bringing in fresh eyes to see the house as a buyer would and helping return your home to “neutral” so that it appeals to the greatest number of people. The goal of preparation is to make the biggest impact for the least amount of money. Our team focuses on the aspects of your home that can be updated to achieve the biggest impact at the lowest price, but most importantly, it is necessary to get people interested online and in for a showing. This may include painting and decluttering but might also mean updating “construction grade” light fixtures, swapping out knobs and handles, and adding accent accessories or furniture. Think about staging your home like “merchandizing” it, to remove your personal touches so that a buyer can easily imagine how it will look with their own style. In short, staging ensures that your home meets the style and expectations of consumers today and maximizes your photo and video presentations. A great listing strategy will always be coupled with a great pricing strategy. As we move from a seller’s to a buyer’s market, the asking price of your home needs to be realistic and reflective of the market. Buyers are taking more time to decide as a purchase is costing them more money than they originally had intended to spend. They are willing to wait for the right product (home) before rushing into a decision. Bidding wars over a property are unlikely and the number of days on market are beginning to increase. It’s important to keep in mind that even if your friend sold their home in April with three offers in two days, that is unlikely to be your experience now. That’s not to say that you can’t sell your home quickly while maximizing price, because you absolutely can! Realistic expectations means understanding that you just might have to work a little harder for it. The best way to sell your home in the digital age is to work with a real estate team who understands what it takes to market and show a home online and in person. The Cyr Team is dedicated to informing and guiding sellers to get the best sale price in the shortest time for our clients. We’d love to connect and discuss how we can prepare, price, market, and sell your home in today’s marketplace. 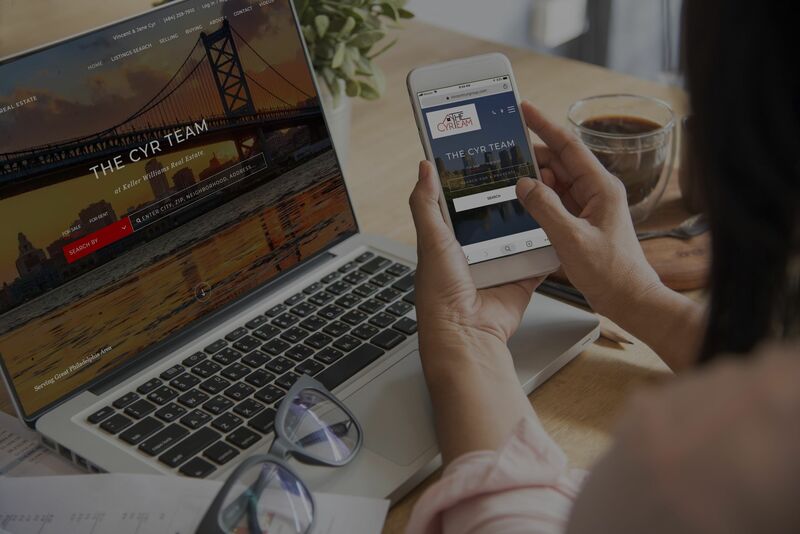 The Cyr Team delivers superior client care to those looking to buy or sell real estate. We educate and empower our clients through one of the biggest transactions of their lives by bringing a structured, process-driven methodology to build consistency and clarity to a real estate transaction. Located in SE Pennsylvania, we are licensed in PA, DE, and NJ to better serve the tri-state area.